Ryan Mostafa Wins the $600 No-Limit Mega Stack Challenge Event! 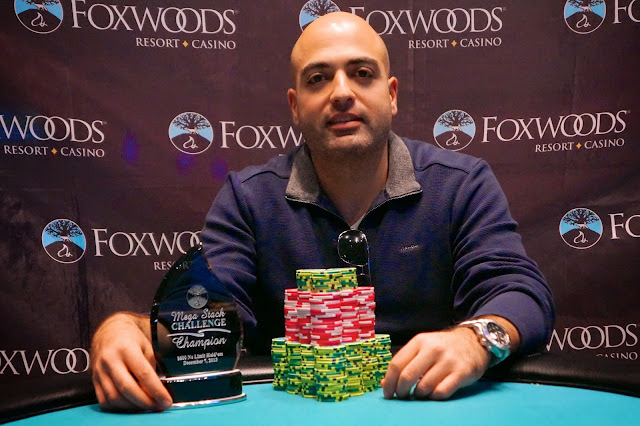 Congratulations to Ryan Mostafa, winner of the $600 No-Limit Hold 'em event at the Foxwoods December Mega Stack Challenge. Ryan and Chris Schonbach chopped the $10,000 that the players left for first place, with Ryan taking the title and $31,876. 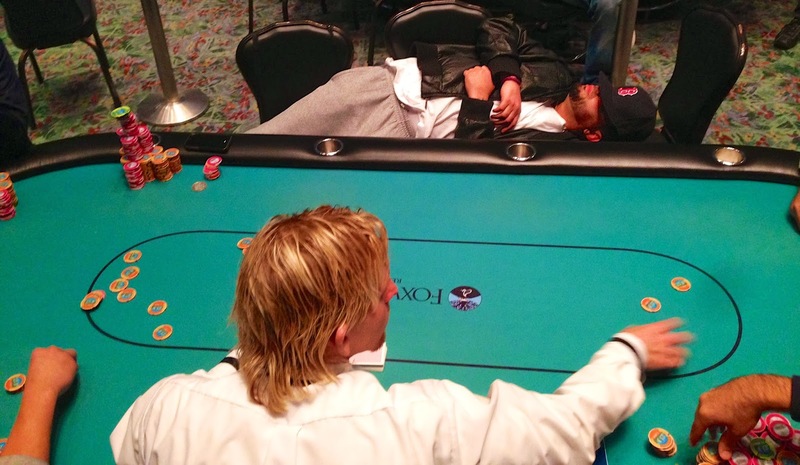 The final four players in the $600 No-Limit Hold 'em event have come to an agreement on a deal. The players are locking up the amounts listed below and left an additional $10,000 on the table for first place. Play has resumed and Raj Patel has been eliminated in 4th place. The players in the $600 No-Limit Hold 'em event at the Foxwoods December Mega Stack Challenge are now on their one-hour dinner break. Luis Vazquez leads the final table with 2,530,000. We have reached the final table of ten in the $600 No-Limit Hold 'em Mega Stack Challenge event. The blinds are currently 8,000-16,000 with a 2,000 ante and the average chip stack is 722,000. We had a total of 80 entrants in the $230 Omaha Hi-Lo Eight-or-Better event at the Foxwoods Mega Stack Challenge. The final 9 spots will finish in the money with first place taking home $4,656. We had a total of 253 entrants in the $230 No-Limit Hold 'em Bounty event at the Foxwoods Mega Stack Challenge. The final 27 spots will finish in the money with first place taking home $8,960. $230 Omaha Hi-Lo Eight-or-Better Event Now Underway! Event #3 at the December Mega Stack Challenge, the $230 Omaha Hi-Lo Eight-or-Better, is now underway. Players start with 10,000 in chips and all levels are 25-minutes in length. This is a one-day event and registration will remain open through the first three levels. There is a $10,000 guaranteed prize pool on this event. Day 2 of the $600 No-Limit Hold 'em event at the December Mega Stack Challenge is now underway. There are currently 42 players remaining and the average chip stack is just under 172,000. The blinds are currently 3,000-6,000 with a 1,000 ante. The second event at the December Mega Stack Challenge, the $230 No-Limit Hold 'em Bounty, is now underway. Players start with 15,000 in chips and all levels are 25 minutes in length. This is a one-day event. At noon, Day 2 of the $600 No-Limit Hold 'em event will resume with 42 players remaining.